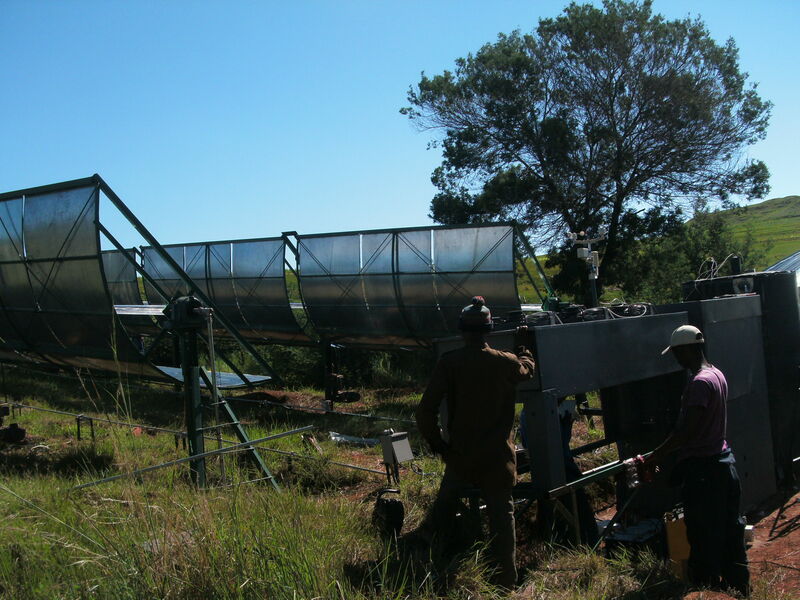 At STG we are technology neutral when it comes to rural electrification – we believe that whatever technologies can get the job done at the lowest price – and with the lowest environmental footprint – should be in the field getting the job done. But – we have also seen gaps in the capabilities of the technologies that are commercially available to serve these markets. For instance, photovoltaic (PV) panels have become very inexpensive over the past decade, but the solar (chemical) batteries needed to store energy from the panels remain extremely costly. Diesel or LPG generators produce highly dispatchable power (meaning it can be available whenever needed), but they are extremely inefficient when serving only small loads and have high CO2 emissions (and fuel costs). And neither of them can produce hot water or heating at a reasonable cost. 1 – Bring other technology options to market that overcome shortcomings in current options. More below! 2 – Engineer hybrid architectures, taking advantage of the strengths of all of the technologies, to optimize on what energy systems can deliver. For more on this, see POWERING RURAL ENERGY AND HEALTH. So what option is missing from the market and yet badly needed? The answer is Concentrating Solar Power (CSP) technologies, which have strengths where these other technologies are weak: storage is incredibly cheap (10x cheaper than traditional batteries), enabling an increase in availability without a huge increase in cost – and retaining the very low emissions of a solar-based system. Because the system collects solar energy as heat, it can produce hot water or building heat extremely cheaply. The catch? CSP technologies are traditionally used for utility-scale (MW!) power plants, however, and the components are generally not available at the scale needed to serve rural institutions and villages (10-100kW). So STG’s team set out in 2006 to address this challenge, designing and field testing a small-scale distributed CSP co-generation platform (“Solar ORC“) to produce electricity and thermal energy supplies renewably and affordably. 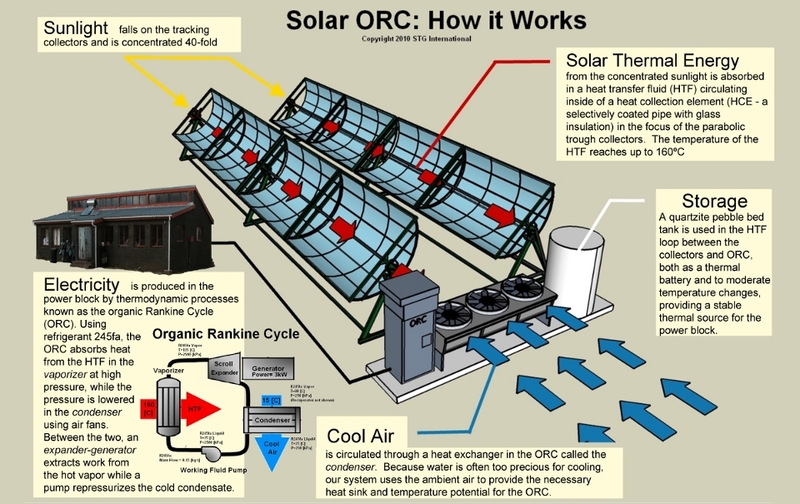 The solar thermal design uses the heat from sunlight directly to drive a heat engine (the “ORC”) and to produce hot water (or cooling via an absorption-chiller type process). By using a cogeneration scheme to recover some fraction of the “waste” heat, a higher fraction of the sun’s energy is captured and turned into useful energy. These microgenerator systems can be built using widely available parts including steel, plumbing supplies, and OEM HVAC components. Specialty components (the aluminum reflective sheeting and refrigerant working fluid) have global distribution chains although STG’s design can use alternatives in areas where they are too costly or difficult to source. The goal is a microgenerator design that can be constructed almost anywhere, unlike silicon-based photovoltaic cells which rely upon high-tech clean rooms for manufacturability. The STG team has been working on the development of this technology since 2004, growing our system size to meet the needs we see in the field. Several generations of prototypes have been constructed and installed in Cambridge, Massachusetts (USA); Bethel, Phamong (Lesotho), Matjotjo Village, Berea District (Lesotho), and St. Petersburg, Florida (USA). The current standardized design provides 3-5kW of electricity along with hundreds of gallons of hot water per day, optimized to provide energy for off-grid schools, clinics, or community centers where both electricity and hot water are in high demand. But CSP is a modular technology, enabling the STG team to build from the ‘standard’ design to create a system of whatever size is needed by the end users we are working with!